"We think we know the ones we love." So Pearlie Cook begins her indirect, and devastating exploration of the mystery at the heart of every relationship--how we can ever truly know another person. It is 1953 and Pearlie, a dutiful young housewife, finds herself living in the Sunset District in San Francisco, caring not only for her husband's fragile health, but also for her son, who is afflicted with polio. Then, one Saturday morning, a stranger appears on her doorstep, and everything changes. 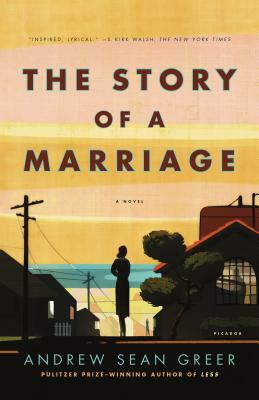 Lyrical, and surprising, The Story of a Marriage is, in the words of Khaled Housseini, "a book about love, and it is a marvel to watch Greer probe the mysteries of love to such devastating effect." Andrew Sean Greer is the bestselling author of five works of fiction, including The Confessions of Max Tivoli, which was named a Best Book of the Year by both the San Francisco Chronicle and the Chicago Tribune. He is the recipient of the Northern California Book Award, the California Book Award, the New York Public Library Young Lions Award, the O Henry Award for Short Fiction, and fellowships from the National Endowment for the Arts and the New York Public Library. Greer lives in San Francisco. How does your view of Pearlie and Holland change in the first course of reading Part I? What were your assumptions about them on a first reading and how did they alter? What was your reaction to Buzz’s arrival on Pearlie’s doorstep? And to the spped with which he becomes such a regular guest in Pearlie and Holland’s home? How does Buzz and Pearlie’s relationship develop and change in the course of the novel? Discuss what brings them together and separates them. At one point it he novel, Pearlie says, “I am sure we each loved a different man. Because a lover exists only in fragments…” (p. 64). Do Pearlie and Buzz each know a different Holland? Does Holland surprise you by the choice he finally makes? “It was a medieval time for mothers,” Pearlie tells us (p.14). How much does Pearlie’s role as a wife and a caregiver define her? Do you think she could have responded differently to Buzz and his revelations? How did you think about or remember the fifties before reading this novel? Why is it so often portrayed as a period of innocence, despite the polio epidemic, the Korean War, the Red Scare, and segregation? Did the novel change the way you think about this period? Pearlie tells us that she was a “finker for Mr. Pinker” (p. 120). What effect does that have on your view of her and your trust in her as a narrator? “This is a war story. It was not meant to be. It started as a love story, the story of a marriage, but the war has stuck to it everywhere like shattered glass. Not an ordinary story of men in battle but of those who did not go to way” (p. 156). Discuss the way the war affects Pearlie, Holland, Buzz, Annabel Platt, and William Platt. How do the lives of Ethel Rosenberg and Eslanda Goode Robeson relate to Pearlie? Why do you think Pearlie goes to the International Settlement? Does her view of homosexuality change in the course of the novel, and if so, how? How did what happened in Kentucky shape both Pearlie and Holland? And how are they affected by the social changes that happen in the course of their lives? How does Sonny’s life differ from that of his parents? “We think we know the ones we love…But what have we really understood?” (p.3). How do you think the novel answers that question? Do you agree with Pearlie’s decision at the end of novel not to meet Buzz? Why does she prefer to walk out of the hotel and into the sunlight?